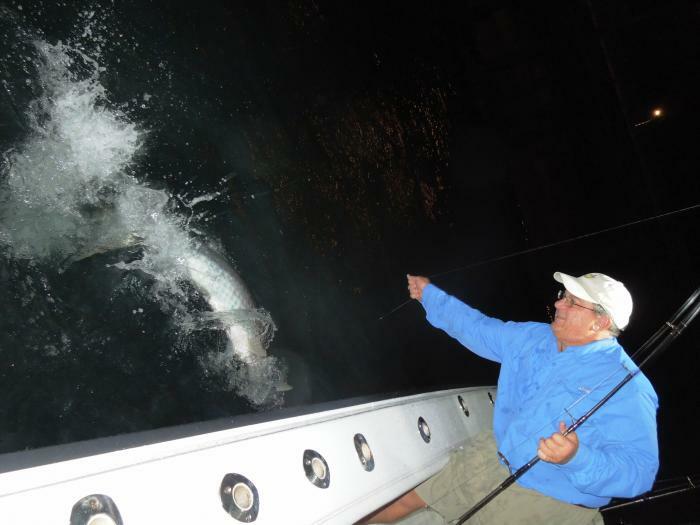 In the Miami and Miami Beach area, we have a tremendous winter season for the tarpon. Large shrimp runs are what get the tarpon going at some point between mid-December and the first of January. Once they settle in around the Inlets, its steady action through the end of June. They feed both day and night, however, on most days it is the late afternoon till dark and thereafter that gets the nod for the most consistent and reliable action. When the tides are right, not only are the tarpon feeding at the Inlets, but they're also in Biscayne Bay and plenty hungry. I refer to catching tarpon in Biscayne Bay as Gorilla Tarpon fishing because the drags are set tighter and it's up to you to apply all the pressure necessary to keep the tarpon away from the many obstructions that can and will part the line. It is for all of the reasons above that aboard Knot Nancy; it is recommended that evening time is the best time to do battle with the mighty tarpon. The tarpon is protected by the state of Florida and enjoys game fish status. Therefore it is strictly a catch and release fish. Bring your camera or video camera along to capture all the thrills of your battle with the silver king. For those with digital cameras, it is highly recommended that you learn how to set and use the camera in the manual mode. In the Auto mode, you'll have to get very lucky to capture a jumping shot of the tarpon. At the Inlets, the area we have to fight the tarpon is large and for the most part obstruction free. It's for this reason that we can use light tackle to challenge the tarpon regardless of how big the fish is. It's only a matter of time, patience, and angling skill. All the tarpon are fought using a stand up style of fishing. It is not necessary to sit in a chair or be strapped into the tackle with harnesses. A gimbal belt that is provided aboard Knot Nancy is all that is needed and some anglers don't even want to use the belt. 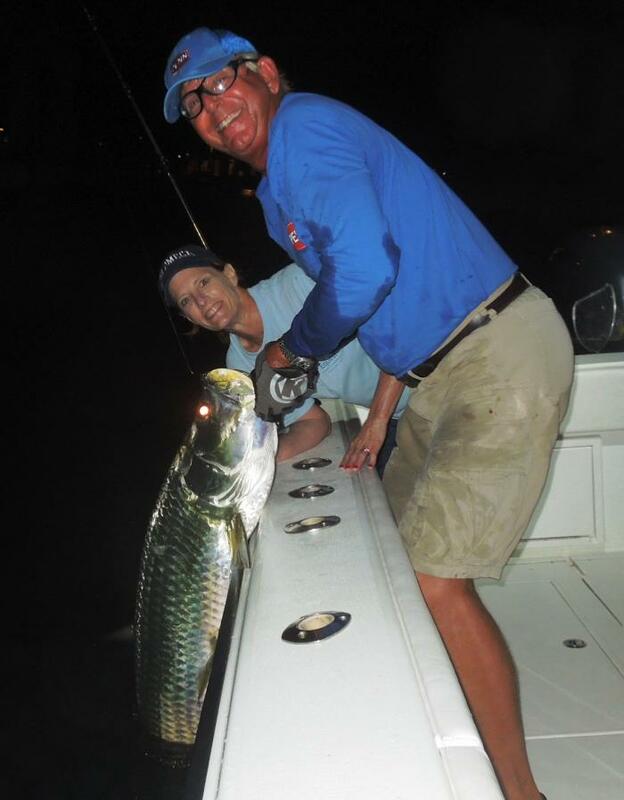 For first time tarpon anglers aboard Knot Nancy, 20# conventional tackle is highly recommended. Once you've experienced the battle with a tarpon, then if you'd like, we can drop down to 12# tackle and up the challenge. For experienced anglers who would like an even bigger challenge, let me know when you book your charter that you'd like to catch your tarpon on 8# line. Conventional tackle is the normal gear used to fish for tarpon. If you'd prefer spinning outfits let me know when you book your charter. To schedule your tarpon fishing trip, give Captain Dave a call at 305 965-9454, email him at nkostyo@bellsouth.net or go to the rates page for more information. It's that easy to schedule your charter.